Great for speeding up the long and arduous process of quitting a fitness center, this gym resignation letter addresses the requirements in breaking a contract. My name is (Name) and my membership number is (number). 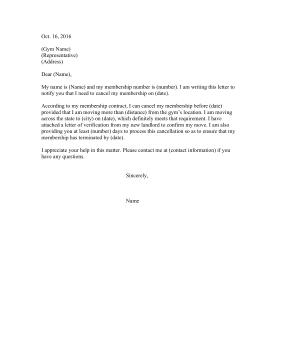 I am writing this letter to notify you that I need to cancel my membership on (date). According to my membership contract, I can cancel my membership before (date) provided that I am moving more than (distance) from the gym's location. I am moving across the state to (city) on (date), which definitely meets that requirement. I have attached a letter of verification from my new landlord to confirm my move. I am also providing you at least (number) days to process this cancellation so as to ensure that my membership has terminated by (date). I appreciate your help in this matter. Please contact me at (contact information) if you have any questions.